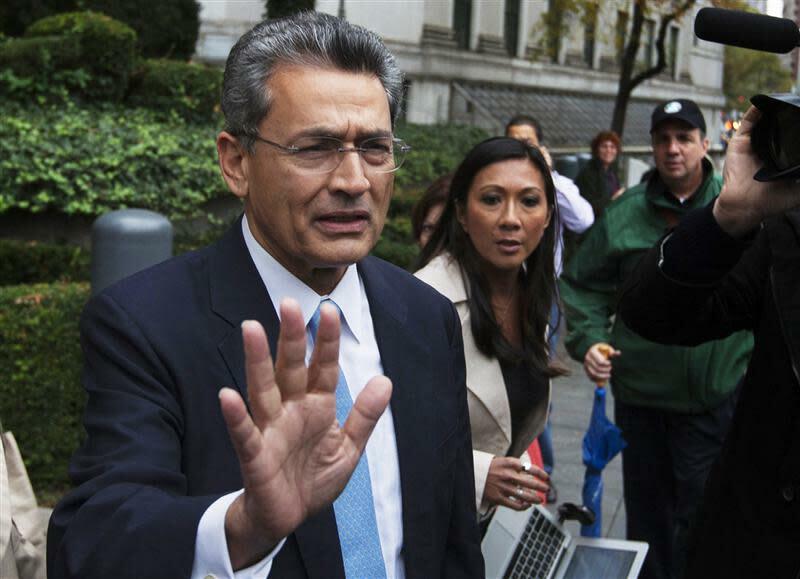 NEW YORK (Reuters) - A federal appeals court upheld the conviction of former Goldman Sachs Group Inc director Rajat Gupta, one of the biggest successes in federal prosecutors' long-running probe to stop insider trading on Wall Street. The 2nd U.S. Circuit Court of Appeals rejected Gupta's claim that wiretap evidence should not have been admitted to show that he leaked news about Goldman's finances, including a crucial investment by Warren Buffett's Berkshire Hathaway Inc, by phone to Galleon Group hedge fund founder Raj Rajaratnam. Circuit Judge Amalya Kearse said the timing of Gupta's calls, coming just one minute after he learned "extraordinary" news about Goldman's finances, followed by Rajaratnam's fast and large trades in Goldman shares, were "powerful evidence that Rajaratnam was given the confidential information by Gupta." Tuesday's decision upholding Gupta's conviction and two-year prison term for securities fraud and conspiracy was a fresh endorsement of the aggressive tactics that prosecutors have used to thwart insider trading, in a probe unveiled in October 2009. Gupta, 65, is a former global managing director of the consulting firm McKinsey & Co, and the top corporate official convicted in the probe. The government has won 79 convictions and guilty pleas in its probe, much of which has focused on hedge funds. Those convicted include Rajaratnam, as well as two portfolio managers for billionaire Steven Cohen's SAC Capital Advisors LP, Mathew Martoma and Michael Steinberg. SAC pleaded guilty to fraud in November. Cohen has not been criminally charged. "We're very disappointed in today's decision, believe Mr. Gupta is entitled to a new trial, and are closely reviewing the opinion with an eye toward further review," Gupta's lawyer Seth Waxman, a WilmerHale partner and former U.S. solicitor general under President Bill Clinton, said in an email. Gupta was appealing his June 2012 conviction, prison term and $5 million fine for feeding tips from Goldman board meetings in the second half of 2008 to Rajaratnam, his longtime friend. These tips included information on Goldman's financial results, as well as a $5 billion investment from Berkshire at the height of the financial crisis, according to prosecutors. "SOMETHING GOOD MIGHT HAPPEN TO GOLDMAN"
Rajaratnam was heard telling a trader that a caller had told him not long before the Berkshire investment was announced on September 23, 2008 that "something good might happen to Goldman." Prosecutors contended that Gupta was the caller, and had contacted Rajaratnam just after emerging from a Goldman board meeting to approve the Berkshire investment. Rajaratnam bought more than $33 million of Goldman stock in the final minutes prior to the market close, before the Berkshire investment was made public, and reaped a profit exceeding $1 million, prosecutors said. Writing for a three-judge appeals court panel, Kearse said in a 48-page decision that there was "ample evidence" to support a finding by jurors that Gupta conspired to pass confidential tips about Goldman to Rajaratnam. She rejected Gupta's argument that U.S. District Judge Jed Rakoff in Manhattan, the trial judge, wrongly excluded evidence that Rajaratnam was cheating Gupta on an investment, and that Gupta had "integrity" and "obeys the law." Gupta has been free during his appeal, and it was not immediately clear when he might begin his prison term. He is separately appealing Rakoff's February 2013 order that he reimburse $6.22 million to Goldman to help the bank cover its legal costs. Goldman was not implicated in wrongdoing. The government's case against Rajaratnam also relied heavily on wiretap evidence, which prior to the insider probe was more commonly associated with efforts to fight organized crime. Rajaratnam is serving an 11-year prison term. Last June, the 2nd Circuit upheld his conviction, saying the use of wiretaps was proper. Rajaratnam has appealed to the U.S. Supreme Court.